I am currently a second year student in the Boston College’s Higher Education program, a Residential Director at Tufts University, and an avid runner. For the past six months I have been training for the Boston Marathon with over one hundred members of the Tufts University community as part of the Tufts Marathon Team (TMT). 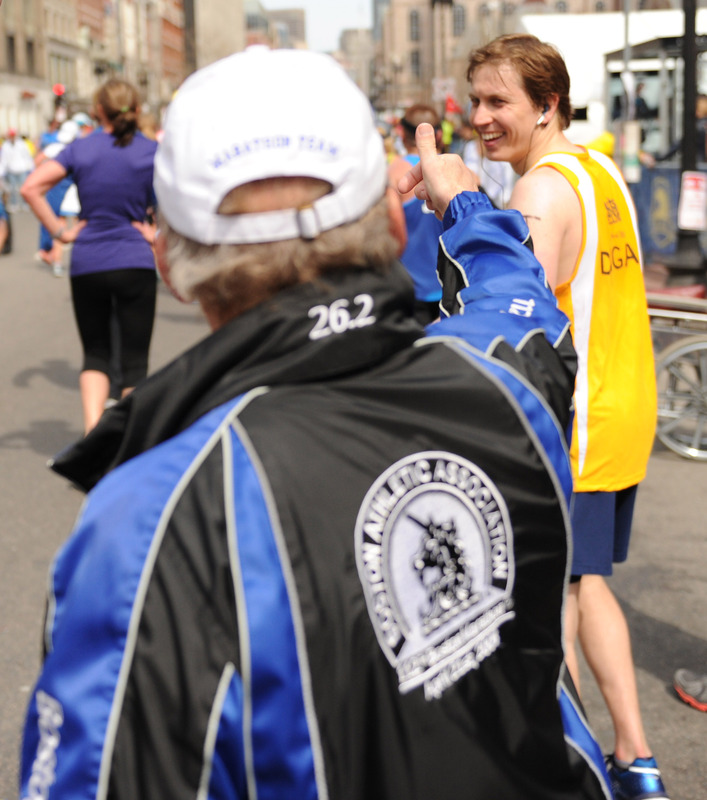 Under the guidance of Coach Don Megerle, the Tufts Marathon Team has prepared, supported, and celebrated approximately 1800 official runners and hundreds of unofficial runners of the Boston Marathon over the past twelve years. The Boston Marathon is called one of the most iconic marathons in the world for its history, ruthless course, and immense camaraderie between runners and spectators. Coach Don and the Tufts Marathon Team exemplify unity and support, which I personally felt during the long wintery training runs on early Sunday mornings and especially during and after this year’s Boston Marathon. Throughout the race, I spotted countless members of the Tufts Marathon Team. I was filled with great pride when I saw the yellow singlet because I had watched these students prepare so diligently for this race and I could see how proud they were to represent their school’s team. Regardless of who was passing whom or how much pain we were enduring at that moment, these runners and I shared smiles, high fives, pats on the back, and cheers for each other and our schools as we ran. The countless supporters who cheered and shouted my name, especially the many Tufts supporters who volunteered, and the TMT alumni for whom this event and this team have meant so much, reinforced these feelings of strength and community. I crossed the finish line at 2:25 p.m. and was welcomed with open arms by Coach Don. I watched as friends from the Tufts team flooded in behind me – people with whom I had run literally hundreds of miles with through one of Boston’s worst winters for marathon training. Two students who I had grown close with crossed the finish line minutes behind and fell into our Coaches arms, shedding tears of relief, elation and pride for their accomplishment. We collected our medals and belongings, a group of friends united by our hard work and success in overcoming an enormous feat and reaching our goal. Standing on the corner of Berkeley and Bolyston Street we heard what sounded like the collapse of a thousand bleacher benches crashing into a heap by the finish line in a roar that shook the buses that surrounded us. Everyone paused, unsure of the cause because tents and buses obstructed our view of the finish. We looked at each other wide-eyed, confused. Confusion turned to disbelief at the sound of a second explosion, and dismay as our cell phones began to erupt with breaking news and text messages from friends and family fearing the worst. We were lucky to escape unscathed and we left the danger area in separate directions. The TMT post-marathon reception, typically an evening of celebration and congratulations, showed a scene of dismay and distress on Tuesday, May 16th. Many of the Tufts runners were stopped before the finish. As they mounted heartbreak hill, prepared for the final stretch and poised for success, their achievement was robbed of them for reasons unbeknownst to them at the time. One fellow TMT runner shared a scene at mile 25 of Tufts students and other runners falling on their knees and sobbing for their loss, so close to the finish that they could taste it. As the story unfolded throughout Monday afternoon he and these other runners turned from personal grief to communal despair at the horrific events that have tarnished such a positive, proud, and unifying event for the City of Boston. During the TMT reception the following evening, runners and spectators shared their grief with the group. Coach Don began by congratulating everyone for completing the marathon. There was no discussion, we had all trained and had all achieved. Still, each member of the team, whether an official finisher or not, felt the frustration in the accomplishment that had been taken away. But not a word of defeat was spoken. Stories and emotions were shared for the survivors of the tragic events. Students expressed deep sorrow, not for their own race, but for the City of Boston. When reflecting on the race itself, runners recalled the immense support and camaraderie that came from other runners and fans on the sidelines of the course. Tears for what happened were wiped away by memories of the hugs from Coach Don and the parents who waited for their children at mile nine. Race day memories of anger were replaced with laughter as one student recalled watching Coach Don sprinting down the course to deliver one of his famous PB&J sandwiches to a Tufts runner who had shouted for it as they past him. The sober mood lingered, but the unity and comfort of the team stood above the isolation and fear that an event like this can instill. I watched as that unity and comfort was on display and felt one more time as each runner thanked and hugged Coach Don on their way out of the gym. As I wondered how best to support my own students in light of the marathon bombing, I reflected on the example that Coach Don set. Coach Don and the Tufts Marathon Team represent the unwavering, unceasing, uninhibited love and support that great people share and that is most needed, most urgent, and most prevalent at a time of vulnerability and suffering. Coach Don is not just an administrator at Tufts University, not simply a swimming and marathon coach. He is a rock and an institution that gives his entire self to his student-athletes. He is a man of about five feet two inches, but his devotion and compassion, the strength he gives to his students, and the unity he gave to our team, stands taller than any attack or threat. Coach Don is a guide and an inspiration that shows me how to be a better professional during this time of struggle: by being a leader who vocalizes, appreciates, builds up, and looks out for his community. The events at and following the Boston Marathon have only exemplified what Don does everyday for his students. He takes pride in the success of his team, which he measures by the relationships built, the experiences had, and the goals accomplished. He has continued to email and speak with his students to echo his praises, give thanks for our efforts, and extend his willing hand (and ears) to those struggling with anything from weary legs to a wounded heart. As a student affairs professional I hope that I can be as giving of myself and caring for my students, particularly in this time of need. 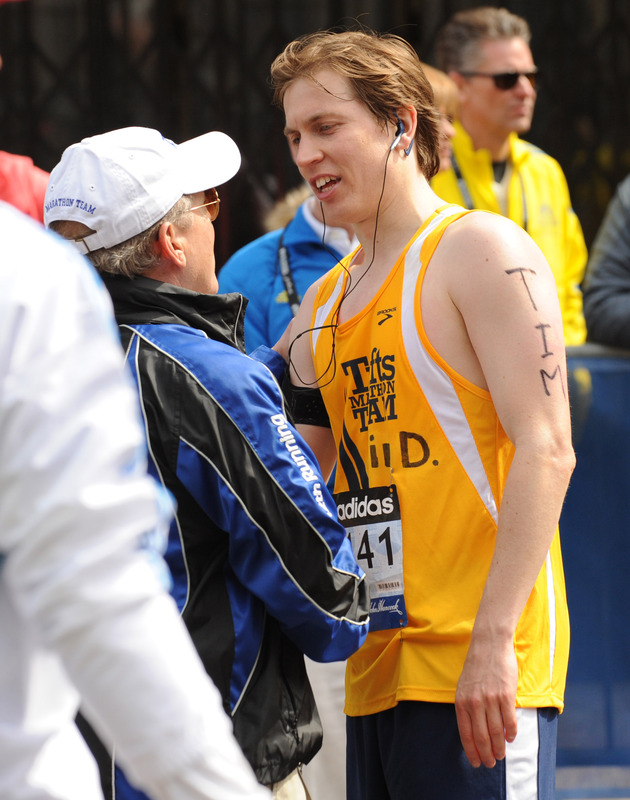 Tim Dugan was a Master’s Candidate in the Boston College Higher Education program, a Tufts University Residential Director, and a marathon runner at the time of the Boston Marathon tragedy. The author’s views are their own and do not represent those of any institution, entity or individual. You can reach out to Tim directly via email. Please feel free to share this on your social network of choice using the link icons below. We also welcome you to share your reactions and stories in the comments section below so we may all benefit from your thoughts and wisdom. Tim, I am echoing all that you, and my son Steve, have said regarding Coach Don. As a parent of a student swimmer, I had many opportunities to watch Coach, not only around swimming but all these years since 1979 when Steve graduated. Coach is present at many Tufts events, and he is PRESENT in the best sense of the word to everyone he speaks to, Go Don! What a beautiful way to capture the day’s events and most importantly Coach Megerle’s immense spirit, which a hard thing to put into words. We are all blessed by having had our lives touched by such a great man! Tim, I was not there, I was not even aware of the bombing for 2 or 3 hours. My daughter called to express her concerns and fears. I was shocked and at first I thought of Coach, Stephanie assured me he was OK as she was checking in through the social media sites. I have know Coach for 38 years when I began swimming for Tufts University in 1975. He has always been a cheerleader, spirit guide, mentor. As I matured (just a bit mind you), I began to recognize “Coach” as a hero, not just an ordinary hero but a super-hero. He is unwavering in his support, encouragement, guidance, love, laughter. His heart is warmer than most (allowing him to walk about in shorts all winter) and his commitment to the goals of others ahead of his own puts this man in a special class. My parents, siblings and children know of him only as “Coach”, a special name. After I realized that “Coach” was fine, I was certain he had gone into the role of caregiver and while I would love to hear his story, I felt the need to respect his time as he is and was too busy providing care and comfort to others. You and I are lucky to encounter such a great man.